You might disagree, but you should never treat your home as an investment. Yes, hopefully it will appreciate over time. But you should buy it because you want a home, not an investment. fast way to improve your score by a few points is to pay down credit card balances and stop using them for two months before you apply for a mortgage. Also, you’ll want to avoid applying for credit (for example, a new credit card or car loan) until after you’ve closed on your new home. Save cash for a down payment and other expenses. Checking your credit report as an adult is vital. Your score is only part of what a lender reviews when considering financing for you. It is important to read your full report, in order to check for mistakes and see if you can make repairs to your report/credit. There is no shortage of companies offering you a FREE credit report on the internet, but there is some things to watch out for.The two national credit bureaus in Canada are TransUnion and Equifax. They will mail you a full report for free by inputting your information on their secure website and sending them proof of identification. In addition to making sure your credit score is in order, you’ll also want to consider the cash you’ll need to make buying your first home a reality. 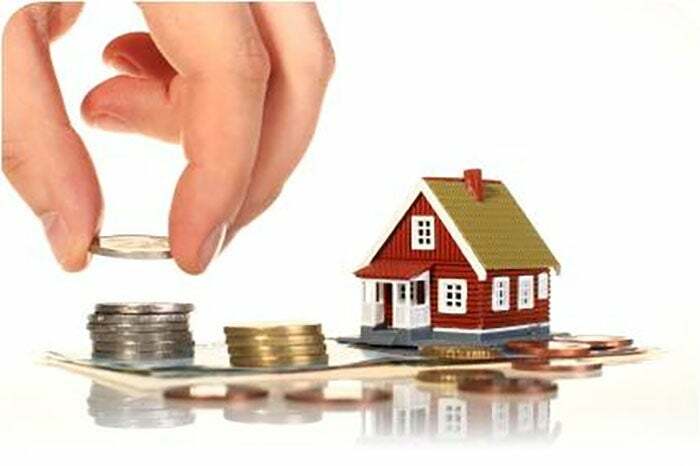 Of course there’s your down payment — typically between 3.5 and 20 percent of the purchase price.As you save money for your down payment, avoid the temptation to invest in the volatile stock market with money you hope to use in the next year or two. While you might be tempted to try to earn a greater return on your money than an online saving account paying one percent, the greatest risk is not having your money available when you’re ready to buy a house.As you save, don’t underestimate how much money you’ll need — you might be surprised at how much cash you’ll need for closing.Get your documentation in orderFinally, if you’re close to putting an offer on a home, begin to collect documents that you’ll need to verify your finances on the mortgage application: paystubs, bank statements and, if you have freelance or self-employment income, copies of your last two tax returns. 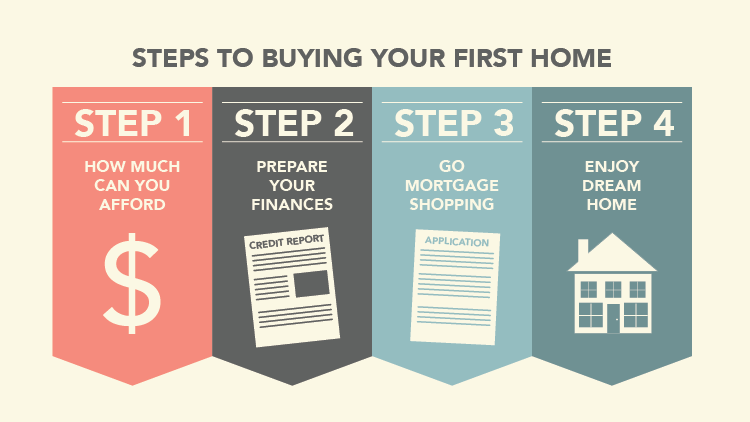 Step 3: Go shopping for a mortgageToo often, home buyers leave mortgage shopping to the last minute and watch their dream home go to another bidder who had financing in order. Mortgage pre-approval is a free and non-binding process that presents you as a serious, qualified buyer when buying your first home.Mortgage typesComparing two mortgages can be confusing. There are fixed-rates and adjustable rates, or ARMs, which are priced very differently. You can take out a mortgage for 30 years or as little as five years (interest rates are typically higher the longer the term of the loan).Most buyers should look at fixed-rate mortgages and, indeed, the 30-year fixed rate mortgage is the most common kind of loan, by far. Still, it doesn’t hurt to become familiar with how mortgage rates work and the different kinds of loans that are available.You may also want to run some scenarios through a mortgage calculator to see how different terms and rates will affect your monthly payment.Mortgage feesTo make matters worse, mortgage lenders charge fees that aren’t necessarily reflected in the interest rate. There can be fees for appraising the home, checking your credit, and preparing documentation.In some cases, you may be offered the option to pay “points” at closing that will reduce your interest rate. Points are essentially prepaid interest. This can be a tricky decision, but it can make sense if 1) you can afford to put down the extra cash and 2) expect to carry the mortgage for many, many years.It can be a good habit to compare mortgage rates online regularly.Private mortgage insurance (PMI)If you put less than 20 percent down, your lender will likely charge you a monthly premium for what’s called private mortgage insurance, or PMI. Private mortgage insurance protects the bank in the event you default on your loan and the value of your home declines significantly.Where to get mortgage rates and pre-approvalThe only wrong way to get a mortgage is to walk into your local bank, ask for a loan officer and accept whatever rate she gives you without ever shopping around.You can compare rates with any number of leading online mortgage lenders or find a local mortgage broker who will shop your application to multiple lenders on your behalf.Learn more about getting mortgage quotes and pre-approvals.SummaryBuying your first home is exciting, but there’s a lot to think about before you start looking. Start by getting all your finances in order, and using online tools to compare mortgage rates, and manage your credit score.